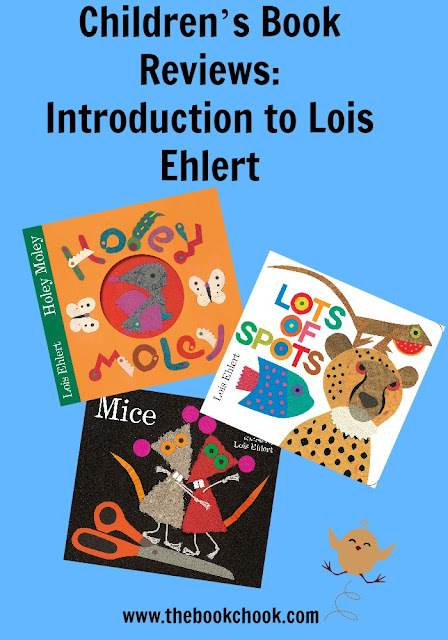 My introduction to Lois Ehlert’s books was shared with a young bookworm. We touched the beautiful pages, traced over lines and peeked through holes. We grinned at each other and pointed out special “bits”. We sighed when we’d finished and both of us WISHED we could make whimsical art like Ehlert! Here’s a little about each book we read. The classic Mice will be familiar to many early childhood educators as a poem once shared with young students, then recited for an adoring audience. I adored being able to see Ehlert’s interpretation and have the poem take on extra layers of meaning for me. Kids will love it as the mice get into mischief. They actually build a collage of themselves and kids can read the labelled tools and materials. The collage throughout Mice is very textural, yet with those same large brightly coloured elements and contrasting solid colour backgrounds that seem to distinguish Ehlert’s work. Kids will love to see just who the “I” is who states “But I think mice are nice” and roar laughing over the final visual twist. A real winner! Get to know Mole, the underground protector of the garden, in this fact-filled natural history adventure with vibrant collage artwork from the Caldecott Honor–winning illustrator of Chicka Chicka Boom Boom. Some might think that Mole is a garden pest, but the truth is, he is a pest-preventer! Mole keeps worms and caterpillars and other crawly bugs from munching up all the growing veggie plants. And so at harvest time, there is a bounty of yummy goodies for the gardeners to enjoy—and Mole is chubby from all the eating he has done and ready to get cozy in his burrow for winter. The text rhymes and is in a really large font. Although the main part of the story describes a mole’s journey and what he sees, for kids who like non-fiction, there is a a really nice double-page spread glossary with images and labels identifying creatures that make holes. What fun to go back through the book to try to identify them in the story! Then there’s the map on the final end papers of Mole’s home and surroundings - tunnels to the no-no lawn and chambers for worm storage will make kids giggle for sure. Bright, highly coloured and full of energy, Holey Moley makes an outstanding addition to any picture book collection. by Simon and Schuster Australia (Beach Lane Books USA) (2014). Lots of Spots is lots of fun! This cherished collection of illustrated poems from Caldecott Honoree Lois Ehlert is now available as a Classic Board Book. Lois Ehlert is at her Ogden-Nashian best in this lively collection of poems about animal camouflage and adornment. Birds and beasts from all walks of the animal kingdom are gathered here, beautifully illustrated in Lois's signature bold and bright collage style. Please don’t dismiss this as just for babies because it’s a board book. The poems are all short, but not overly simple - I think they would be appreciated by kids 5-8 at least. The images are aimed at toddlers, being large, colourful and on a stark white background. But again, I think older kids will really appreciate them, and perhaps be inspired to go on and try their own collage pictures. Buy it for kids when they’re young - start them on poetry early! - but with the knowledge it will work for many years. NB Lots of Spots is also available as a hardcover picture book that is not a board book, if you would prefer it. But just think how robust a board book would be through repeated readings!